Gopher tortoise, photographed at Pondhawk Natural Area, Boca Raton, Palm Beach County, in March 2018. There are many links in the chain of life that makes up Florida's natural world. The gopher tortoise, Gopherus polyphemus, is one of the most important. It is to scrub and flatwoods what the alligator and pondapple are to wetlands. They create shelter for many species, and help propagate others. It is a survivor, millions of year old, but its existence is threatened as its habitat disappears. 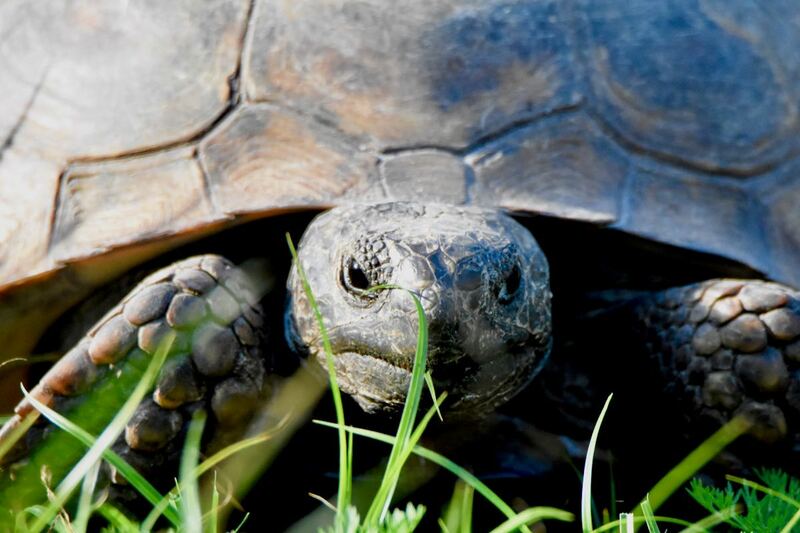 Gopher tortoises get their name from their habit of digging burrows, which can be as long as 47 feet (the longest ever found) but more commonly about 15 feet. They can be as deep as 20 feet, but typically six to 10. 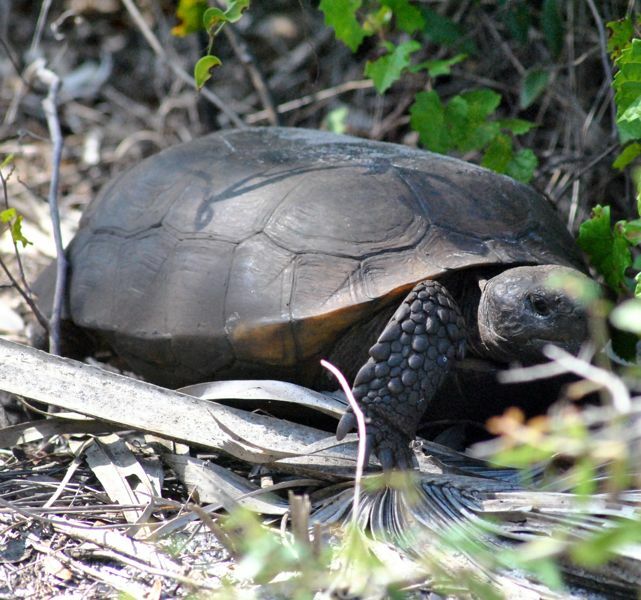 These excavations protect the gopher tortoise against predators, temperature extremes and fire. The last one is particularly important because this is a species that depends on occasional fires to regulate its environment. Fires create open space for tortoises to move about and allow the plants on which they feed to grow. But the usefulness of its burrows extends well beyond the gopher tortoise. As many as 350 to 400 other species find shelter in these holes. Burrowing owls, mice, opossums, rabbits, even eastern diamondback rattlesnakes will make their homes in a gopher tortoise burrow. The tortoises themselves help spread the seeds of the plants they eat — grasses, blackberries, pawpaw, gopher apples, pricklypear and other species. All of this makes gopher tortoises a "keystone" species. Remove it, and whole ecosystems tumble. Gopher tortoises are one of five tortoise species found in North America, and the only one found east of the Mississippi. The species evolved some 60 million years ago. Florida has the largest gopher tortoise population, but they're also found in Georgia, South Carolina, Alabama, Mississippi and Louisiana. They have long lifespans, 40 to 60 years. but they don't reach sexual maturity until they're somewhere between nine and 21 years, depending on gender and where they live. Mating season is between April and November; females lay one clutch of five to nine ping-pong ball-sized eggs a year. The hatchlings face long odds on reaching adulthood; they will hide from predators in dead leaves or in mom's burrow. Adults can be a foot or more in length and weigh as much as nine pounds. They have few natural predators, but domestic cats and dogs can do severe damage to a tortoise colony. Cars also present a significant hazard. But the biggest problem is the loss of habitat. Scrubs and flatwoods are prime sites for shopping centers and homes. Fire suppression is another problem. 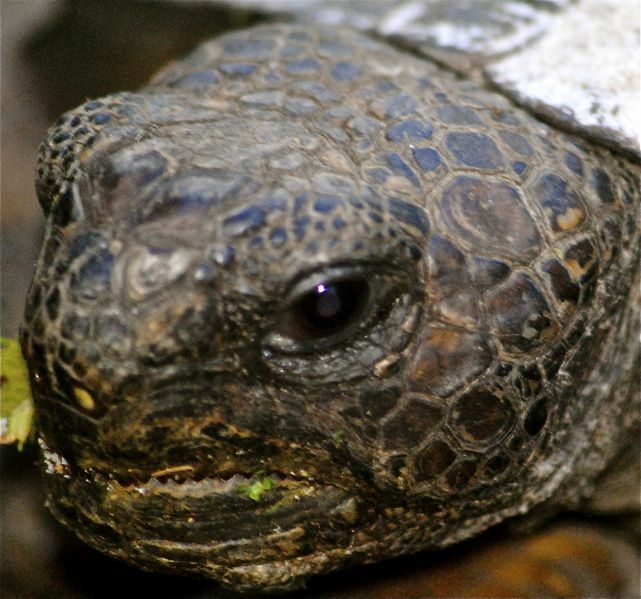 Florida and federal officials have given gopher tortoises protected status. The state also has begun a program that gives landowners incentives to keep gopher tortoises on their land. You can see the gopher tortoises thick rear legs and paddle-like fore legs, which it uses for digging. Taken at Seacrest Scrub Natural Area.